Another great news, our friends! After getting to the finale of European IT Awards which we enjoyed immensely, we’ve got an eye and soul pleasing announcement from Hermes Creative Awards. We joined this well-established international competition for creative professionals with our Rebelle and Amberlight 2 software some time ago and hoped for the best. And now, we’re pleased to tell you that both programs succeded and were recognized for excellence and innovation in their category. Being a Platinum or Gold Winner is a tremendous achievement as there were about 6,000 entries from all over the world and only about 15% of the entries won this award. We feel honored to have our work praised by some of the best in the biz. 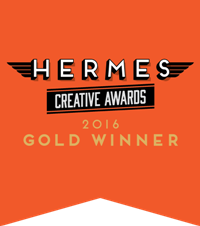 To see all Gold and Platinum Winners in 2016 please visit Hermes Creative Awards.